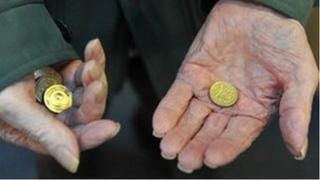 Nine out of ten of the poorest areas in England are in the North West, a church charity has said. A list collated by The Church Urban Fund (CUF) found areas in Greater Manchester, Liverpool and Lancashire were the worst-affected by poverty. Cannon Park in Middlesbrough was the only community outside the North West to feature in the bottom ten. CUF chair Paul Hackwood said he hoped the data would "create a much greater awareness of poverty in England". The list was produced using the charity's online poverty indicator tool, which combines government statistics from a number of areas, including life expectancy and child poverty, and shows the results using the CofE parish system. Liverpool features heavily in the list, with five areas making the top ten, including Toxteth West, which has up to 64% of children and 63% of pensioners living in poverty. Greater Manchester features three times, with Shaw Road in Oldham, Kirkholt in Rochdale and Manchester's Collyhurst all included. South Shore in Blackpool showed the lowest male life expectancy, at an average of 66 years. Mr Hackwood said that while the statistics painted "a bleak picture of these areas, what they don't show is the strength of the community and the work so many people are doing to support those that have fallen on hard times". "We urge people to go online and try out the tool and find out where their community ranks in terms of poverty indicators," he said. "We hope it will create a much greater awareness of poverty in England and bring people from affluent and less affluent areas together to think about what could be done to support those that are living in poverty." The CUF also found the ten most affluent areas in the country, seven of which were in the South East of England. Alderley Edge in Cheshire, Wheldrake in York and Houghton on the Hill in Leicestershire made up the other three top ten places. Church Urban Fund was founded in 1987 and works with over 300 community projects across England to help the poor.